Before visiting Seattle, everything I knew about the city came from the movie Sleepless in Seattle –rain, houses on the water, and spectacular scenery. After visiting for myself in April, I can affirm that one of these things in particular holds true. 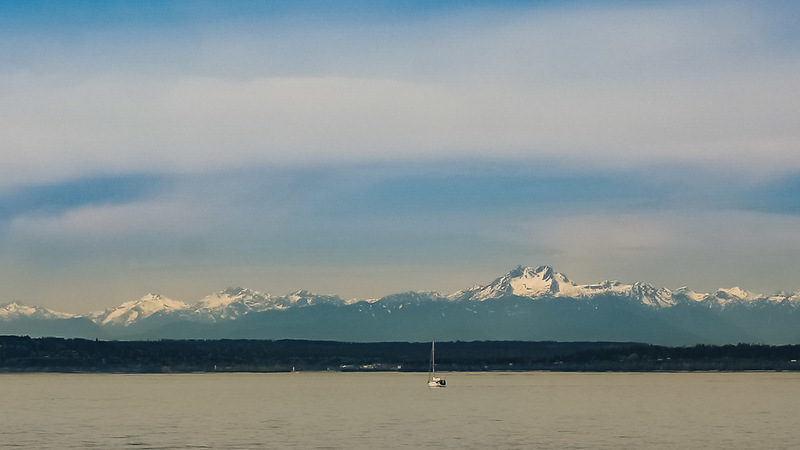 The natural scenery of Seattle is incredible. I spent many hours sitting by the water in the glorious sunshine, admiring the sail boats with snow-topped mountain ranges in the background. First things first, check into your sleek and modern suite at the Hyatt at Olive 8. This downtown hotel is the first LEED (Leadership in Energy and Environmental Design) certified hotel in Seattle as a result of their cutting-edge sustainable and environmentally-friendly features. After checking into your room, head to level one and grab a cocktail at Urbane. Not only is this a great place to unwind, but the neutral exhaust from the restaurant and bar is repurposed by wind turbines on the roof to help power the hotel. If you are feeling tense after your long flight, you might instead want to have a dip in the indoor pool and gaze out over the incredible city skyline. It is now time to head out and taste some of the delicious, locally-sourced food that Seattle has on offer. Only 15 minutes away on foot is Local 360, a restaurant focused on serving high quality sustainable produce. The majority of their ingredients are sourced within a 360-mile radius of Seattle and their menu has something for everyone, with plenty of vegetarian options available. After dinner, join an art walk through one of Seattle’s neighbourhoods. These walks take you through a different neighbourhood each night to explore the local art scene. They are the result of artists, art lovers and businesses working together to build a stronger local art community. You never know, you might just find something special by your favourite local artist. If you can manage to leave your comfy bed, hop on the bus and head over to the trendy Fremont area for brunch at Tilth. As soon as you step into this restaurant you will feel like you are a guest at a friend’s home. They specialise in seasonal, sustainable foods, serving everything from biscuits to mini duck burgers. The best thing about Tilth, however, is their passion for the local community. Owner-chef Maria Hines has been working on fundraising and educational outreach for the Fresh Bucks project, which doubles the purchasing power of residents on Federal food stamp benefits when they shop at their local farmers market. After brunch, spend a few hours aimlessly wandering around Fremont and exploring this intriguing neighbourhood. Make sure you follow your nose to Theo Chocolate, an organic, fair-trade chocolate factory and shop. To learn more about the chocolate-making process (and to taste it for yourself), make sure to join one of their factory tours. Head back downtown and spend some time in Pike Place Market, one of the oldest continuously operated public farmers’ markets in the US. Here, you can buy anything from flowers to artichokes, king salmon or handicrafts. You can even grab a coffee at the original Starbucks! When you have worked up an appetite, walk around the corner to Homegrown Sustainable Sandwich Shop. This chain store serves a wide range of delicious sandwiches made from sustainable produce. They even considered sustainability when building, with each of their stores using recycled and reclaimed building materials. For the highlight of your weekend, take a sunset kayak with orca in the San Juan Islands with Sea Quest Expeditions. These islands are the top orca whale watching location in the US and are home to the first park in the world dedicated to whale watching. As the sun starts to set, keep your eyes peeled for orca playing as you paddle through the water. Once you are back on land, keep the nautical theme going with a sustainable seafood dinner at Bar Sajor. The dishes are unique in that they are all cooked over a wood flame to ensure that the focus is on the high-quality ingredients. The friendly and open restaurant is nestled into a stunning 1920s building on the waterfront, creating a warm and inviting atmosphere. Next, walk around the corner to Forge Lounge, a bar with an industrial turn-of-the-century theme. Owned by two full-time firefighters and a local musician, this bar specialises in handcrafted cocktails from locally distilled spirits. Don’t leave before trying the Rum Springa! After checking out of your hotel, treat yourself to breakfast at the Wallingford Café from The Essential Baking Company. Try one of their seasonal breads, pastries or desserts (gluten-free available). After breakfast, wander through the Daybreak Star Indian Cultural Center, part of the United Indians of All Tribes Foundation (UIATF), which celebrates the heritage of indigenous people in the Puget Sound region and beyond. Here you can view their permanent art gallery and temporary exhibits featuring artwork from local and national Native American artists. It’s the perfect way to end your visit to Seattle. Public transport in Seattle is a breeze. From the SEA-TAC Airport, take the Link Light Rail into the centre of town. When exploring the city there are a range of buses and trains available to you. For cycling travelers, Seattle also has Pronto, a nonprofit bike share scheme.